Use GPS with offline maps, and have all necessary info non-stop on your iPad!! Works completely OFFLINE! No need network or WiFi! Cambodia is not only Angkor Wat, but offers much more - amazing seaside, places for hiking in jungle, delicious and cheap seafood just next to see! Explore this beautiful country and there culture! 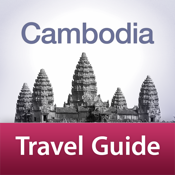 We ourselfs traveled through Cambodia and we perfectly know how important is to have exact informations right with you! With our app you have everything on your iPad! We use our informations and photos collected from travel, open content from well renowned sources, like Wikipedia, Wikitravel and Openstreetmap. This is guide targeted mostly for backpackers. If you are looking for recommendation for 5* hotels or restaurants, most probably you don't find them here. We encourage travelers to try new, small, family-owned places or restaurants which are not mentioned in any travel guide. Help to spread wealth in this still poor country!